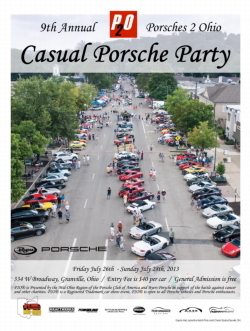 MORPCA has a annual “Porsches to Ohio” (P2O®) casual car show, held in Granville, OH typically the last weekend in July. A peoples choice Porsche specific car show run by MOPRCA supporting central Ohio charities. P2O® has attacked over 400 Porsches in recent years to this weekend event. Support of P2O® has enabled MORPCA to contribute over $25,000 (from this event alone) to local charities in the past 2 years. This is on top of other charitable giving MORPCA has been fortunate enough to do also in past years. The cleanest, most original, and most attractive automobiles reward their owners in concours events. Since a clean, original and attractive Porsche is even more special – these competitions enjoin the membership to engage in all manner of elbow grease and magic to get the machine clean. A concours is really a beauty contest for automobiles and the competition is usually very keen. As the years have gone by, we also continue to see the rare and beautiful surface as winners. It’s always good to see older Porsches age with grace. Competition rules can vary from event to event, and often do. These competitions, can be peoples choice awards, such as P2O® (where some just drive and park, yet others step it up to show their “baby”) or fall into classes by type and age such as Parade, with arrangements often made to cover “Top Side Only”, so a dirty bottom need not keep you from entering. Look for more details on MORPCA’s P2O™ follow the web link. Details on the annual PCA Parade can be found on the national PCA web site. If looking for more car course activities beyond national PCA events like Parade and regional MOR events like P2O™, there are other non make specific car shows and judging at events like the Ohio Arthritis Car Show which has the interest of some Porsche owners around Ohio (some of which are fellow MORPCA members).